The logical mind often keeps us in a box, a known safe place. The creative imaginative mind can take us where we want to go, even if just in our own head. After working over a decade and a half now with the way that art can lead us on a path toward living the dream, I am more determined to assist others in this discovery. The more you focus on your potential, on your heart's desires rather than fear, the more miracles seem to show up for you. One simple method to see this in action is by using a vision board. Creating a vision board assists you in seeing it to believe it. What is it you want? Think of ONE THING and let's focus on this. You have to see it to believe it? That is what most people think. Learn to manifest what you want to believe. Create a vision board today. Here is a very basic Vision Board lesson. The foundations of manifesting are simple…. What do you want to achieve, do, have, be? Visualize this. Better yet, find a photo of this idea in a magazine and paste it to a poster board so you don’t have to force yourself to picture it, you just see it each time you pass it by. What benefits will come from this accomplishment? Add those images to the picture. What does it feel like to now be this person who does, is, achieves, etc. based on the accomplishment of this desire? Feeling the accomplishment helps the body, the brain to move toward the accomplishment rather than focusing on the fears that it has thought of in the past or that replay in your mind. Focus on what you want, not on what you are afraid of. The vision board is an excellent way to do this. I'll give you and example of one of my desires... France. I wanted to spend time in France. One day it was cold outside so I put on my beret, a shawl and scarf and looked like I would if in France. Later I used this image to put on my vision board. You can cut out any image from a magazine to represent you. I found pictures of Paris and places in France that I wanted to visit. They were placed on my board next to the photo of me living my dream. Out of the blue, a person called me and asked me to bring my workshops to France. I said yes and this past September, went to France. The above list is a great starting point! Try it out and let me know who you do. Will this automatically work? DO YOU NEGATE YOUR DESIRES? If you believe it is not possible, you may unconsciously place obstacles in the way. What if I said.. "I can't afford the time off or to spend the money?" I would have possibly shut down the process of like attracting like. The invisible vibration we put forth would have been, I cannot go to France. Instead, I was open. How about you? What are you open or closed to? When you say you want something and then say I can't, you probably are right. Yet, if you say, I can somehow.. again, you are probably right. In the Energy Workshops headquartered in the gorgeous, sunny Sarasota, FL, we gather to experience a shift in our mindset. You learn how you can find out where you are standing in your own way concerning your desires. Let's say, you want to attract wealth, yet you have a belief that rich people are greedy, you may be sabotaging your progress in acquiring abundance. Once you see beliefs come forth that you don't know you hold and then make them fit your new mindset, you allow abundance (or your desire) to manifest more easily. I remember discovering a crazy belief I had about money using a process I teach in the workshops. It set me free once I saw this insane unconscious belief. There are one day workshops (click here) and 3 day workshops are in planning stages. The more days we have together, the more I can assist you in expanding your creative mind and you can see where you fall into old patterns and practice new ones that are more conducive to your desired outcomes. In the 3- 5 day Energy workshops we practice living as if it is accomplished and you are able to feel what shifts happen as a result. We all have blindspots and we often need others to show us where we are holding ourselves back. Then you begin to let go of the habit of listening to the fears inside of your mind. Instead focus on the new possibilities and see for yourself all the benefits that happen as a result. Live the dream. It is possible. The shamans say we dream the world into being. Let's make the collective dream a better one! 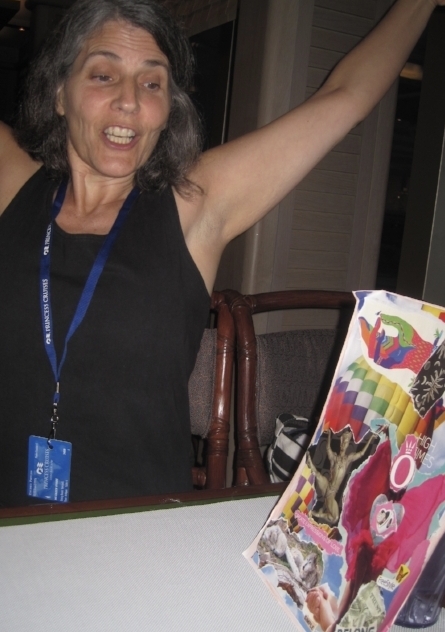 On a recent cruise with Shaman Eileen O'Hare she expresses the feelings of empowerment by the visions on her vision board.